As the Catalan referendum takes place despite being claimed illegal by the Spanish government, social media users have posted videos of different happening throughout the day. From police action to voting stations, here’s a selection of some of the videos seen on Twitter today. 1 – Police vehicles are shown arriving in Barcelona hours before the Catalan referendum polling stations open. 2 – Catalans line-up to vote. Voters were seen lining up as early as 5am, 4 hours before polling stations were set to open. 3 – First images of violent clashes between voters and police begin to appear on social media around 9am as polling stations began to open. 4 – Rubber bullets being fired and injured people were caught on video by social media users at 10:30am. 5 – Crowds were filmed chanting loudly to Els Segadors, Catalonia’s official anthem, as voting took place. 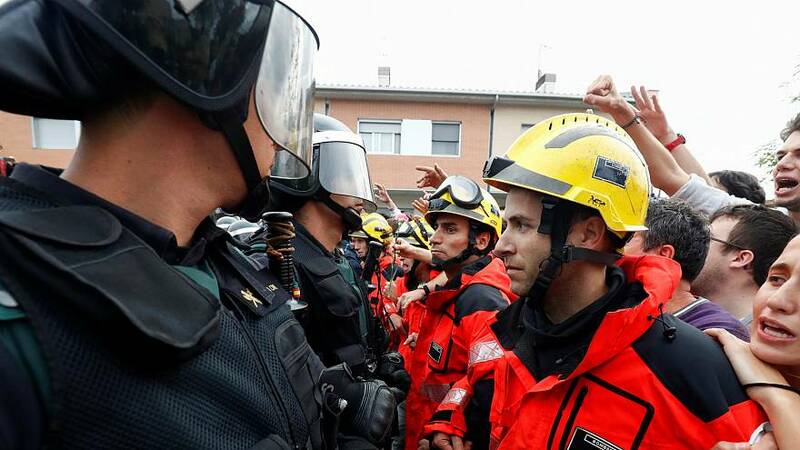 6 – Firefighters are shown creating a human barrier parting the Spanish civil guard from the crowd. 7 – An elderly woman celebrates on camera after voting at the referendum. 8 – A video also shows a voter wrapped in the Spanish flag and being cheered by those in the polling station. 9 – Spanish Guarda Civil and Catalonia’s local police, the Mossos, shown clashing. 10 – This video shows crowds pressing against riot police and forcing them to back out. 11 – In this video, Catalans are heard cheering from outside as voting polls closed. 12 – Crowds were filmed celebrating as the Catalan government announced 90 percent voted in favour of independence.